Stories about adventure and travel and teaching in Bhutan, with a focus on the nature and Buddhism of a nation that borders Tibet to the north, Nepal to the west, and India to the south. Since I was just entering my first adolescent beginning as a man, I’ve had this phenomenon with love: whenever I really liked a girl I would feel something like a kick in the gut when she walked in the room. Not painful, mind, but like a sudden, intense rush of butterflies. This was always the proof that I waited for: no kick in the gut, no love. You may fear at this point that you’re a paragraph into a sappy blog post about love. Well, in a way, you are. But don’t worry; I’d sooner post musings about my bowel movements than start blogging about such emotions. So be patient, that strange opening will make sense soon enough. I’m sitting now at my favorite home-away-from-home in eastern Bhutan. I have three hours left in this three-day drive from Thimphu back to my posting in Wamrong. To be clear, I say that as a celebration, not a complaint. The drive is long and difficult, but any English teacher worthy of the name knows that the road is always a metaphor for life, and this bumpy, rough, twisting road I’ve been riding on is just about the way I think life ought to be. Once you’ve been in Bhutan long enough to know people, it’s basically impossible to travel alone in the true sense. My journey to here was a hopscotch of reunions: coffee dropped off at Sarah’s house, perched on the rim of a U-shaped valley -- too incredibly, perfectly green to believe -- above Trongsa,; a night of being chewed on by two peerless dogs in Jakar, where I also happened upon a friend I hadn’t seen in months, and so on and so on. Even if you don’t run into old friends on the road here, you’re sure to make new ones. Such is the nature of life in Bhutan, or so it seems after my short time here. Best of all, though, is the constant supply of natural beauty that rolled past as I moved eastward with Gio, my trusty driver. I have always preferred silence when traveling; it’s a meditative time during which I silently contemplate the land. My brother David once said, many years ago, that you can tell how comfortable you are with a person by whether or not you’re able to ride in a car together for a long time without speaking. Gio and I understood each other perfectly in this regard: we spoke occasionally, little, 5-minute snippets of conversation, but we were comfortable with silence. And the landscape of Bhutan does demand silence. I find myself fishing for a metaphor to describe it, but in truth, any metaphor I consider seems insufficient, not worthy of the mountains and valleys that dwarf us here, the constant stream of smells and sounds that flowed past as I sat silently receiving it through my open window. Above all, there were two natural features that moved me on this journey. First, this being monsoon season, there were moments when we were above the clouds, climbing to the top of some la or another. The world became illuminated with the powerful, mid-summer sun that is usually veiled by thick clouds, and we could look all the way down the valley below, where, on the opposite side, a ceiling of rising clouds floated over the river at the bottom. Secondly, there were frequent waterfalls as we climbed up the side of these valleys, falling to the roadside from a source mysterious and hidden in the thick, lush vegetation that grows right up to the pavement. The water would tumble noisily down only a few feet from us like an apparition as we passed, and on some stretches of road we passed them every thirty seconds or so. So, over the course of three days, I especially appreciated these two scenes. And about halfway through the second day, as I followed with my eyes the route of whitewater rapids that boiled past us, I felt that feeling, my stomach suddenly electric with emotion that I had only felt as love for a person before. The first time, I thought… no, I must be carsick. But it happened again and again – every cloud-shrouded valley, every waterfall, over and over again for two more days. I’ve had two running jokes this year, responses to two of the most common questions I’m asked by Bhutanese who meet me or know me. “Where will you go after Bhutan?” they will often ask, assuming that like most foreigners, I’m passing through for a year, maybe two, before returning to the life they imagine we live in the west. My answer to them is, “six feet underground.” That answer is a lie, of course, because I hope to be cremated in the traditional and proper way, but the meaning of the answer is not. Others ask, “How long will you stay in Bhutan?” To them my answer is, “I don’t know. 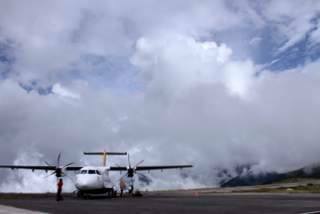 It depends on when I die.” These were mostly little linguistic games, ways of challenging their assumption that every foreign person only visits Bhutan as a long- or short-term tourist. But after the experience of the drive across the country, after feeling that unmistakable, physical sensation of emotion that has always revealed true love in my life, I now suspect that those answers weren’t jokes at all. There is something special about Bhutan that is beyond its people or its mythical GNH or its culture. The land itself is the most powerful thing about Bhutan, this environment that dwarfs us and humbles us and defies us, we silly humans who are always so intent upon owning and dominating and defeating, everything and everyone, we who do everything we can to forget how weak and insignificant we really are. And yet the land here destroys that illusion, refusing description even as I write about it now. I think that everyone who lives here knows this same truth; life remains simple in Bhutan because the land reminds everyone, every moment, how small and simple we all are. It's nice to read back through these old writings, now, as I prepare finally to chronicle the experience of those three years in Bhutan. So much about life there made it difficult to write from Bhutan, but I think more than anything it was something I read from Hemingway in A Moveable Feast. He said that you can never write about where you are, only where you were, and I found that to be true. Now that enough time has passed and I can reflect upon the many experiences that defined my three years in Bhutan, I will take up this blog again and finally tell the stories I was too busy living through to write about. I'll begin with a few of my favourite photos from my time in Bhutan. There are many more, so there may be a few posts like this, but this first set offers a glimpse into the life of a volunteer teacher in rural Bhutan. I hope they're enjoyable, and please do comment if you have any observations or questions to share. I've been lying a little in this blog. 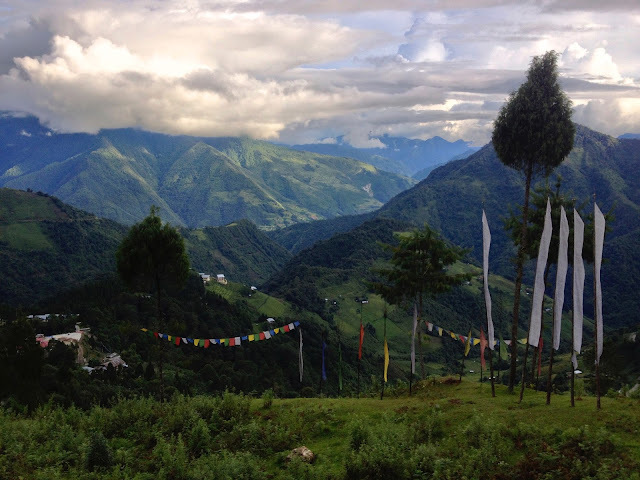 Life in Bhutan wasn't all prayer flags, green scenery and magical clouds. There was another side too. This is a genuine message I sent to a family member during my first days in Bhutan. I read it now with a smile, with a sense of dramatic irony because I know that everything turned out OK. But it's an honest artefact of how it felt to be a few days into a new life, completely removed from anything familiar or safe. And -- dammit, I loved those headphones. It's hard to imagine Bhutan without Buddhism. It's the last of what used to be a string of Buddhist nations in the Himalayas; Ladakh and Sikkim were incorporated into India, and -- we all know the tragic and unjust fate of Tibet. Buddhist philosophy, tradition and ritual are essential to Bhutanese culture in almost every facet of life. For this entry I've chosen a few images that I think might communicate the way spirituality permeated every moment of life in Bhutan, from the moment we woke to the moment we slept; not a proud or selfish spirituality, not a showy or false spirituality, but a simple and natural compassion and a constant acceptance that humans are simply part of the scenery, every bit as fragile as the tiniest life forms with which we share the earth.